Printing, copying, and scanning at the Briscoe Library and elsewhere in the institution are managed through the PaperCut system by UT Print Services. Locations: Printer/copiers are located in the library and also in several buildings throughout the campus. Laptops: PC and Mac users can install Papercut drivers to print directly from their devices to a Shared Campus Printer. Smartphones and tablets: Mobile device users can use HSCWave WiFi on campus. Web Print can be used to print from mobile devices. Off campus printing: If you are off campus, you can logon to VPN to print a document. Getting help: Briscoe Library staff provide assistance to library users at printer/copiers in the library. Questions about accounts, refunds, and problems using campus printers should be directed to UT Print. The following link goes to a collection of FAQs compiled by UT Print. 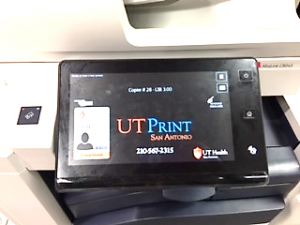 A UT Print account is required for using Shared Campus Printers. Fill out the form, including the PID for billing. Briscoe Library Guests who are not affiliated with UT Health SA are not able to create accounts. They may still print or copy by obtaining a Guest card at the Circulation Desk. How Do I Print, Copy, or Scan? Detailed Instructions on setting up accounts, adding money, and other activities related to PaperCut printing or copying are in the UT Print Services link, below. The default is for Color, so be sure to select Black and White if you don't want to be charged for color printing.